Ó hÓgáin - anglicised Hogan, earlier O Hogane &c., the root word is 'óg', meaning young, which is part of an early personal name, Ogan, meaning 'youth'. Ó hÁgáin, usually anglicised Hagan, is the Ulster form of this name. Ó hEochagáin (added by Woulfe, 'Sloinnte Gaedheal is Gall',1923) - anglicised Houghegan, and occasionally Hogan, especially, according to Woulfe in Co Galway. The root is the personal name Eochaid, with the meaning perhaps of 'horse rider'. We can refer to an ancient proto Indo-European root, c.f. 'equus', Latin 'horse'. 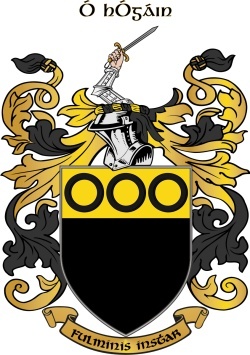 Ó hAodhagáin - anglicised Hagan, also occasionally Hogan; the root is 'Aodh', a common ancient first name, from proto Indo-European, meaning 'fire', c.f. aedes, Latin. This name was originally of Oriel, i.e. south Ulster, and has probably fallen together to some extent with Ó hÁgáin. The first name mentioned above is, perhaps, the best known as Hogan. The main sept is that of a family who were of the family of Brian Boru, and thus of the Dalcassian tribe (Dál gCais). Their original holdings were north of Nenagh, in northern Tipperary. A Hogan family were also established early in nearby Lower Ormond Barony in the same county. They spread into nearby Co Clare. Another important sept were of the Corca Laoighdhe, whose tribal lands were in south west Cork. (Barony of) Lower Ormonde, Hogane 83 (families); Kilnamanagh, Hogane 16; Iffay & Offay, Hogane 59; Eliogurty & Ikerrin, Heogan & Hogan 6; Owney & Arra, Hagane 38; Clanwilliam, Hogane 28. Inchiquine, O Hogane & Hogane 13; O Hogane &c 6; Corcomroe, Hogane 9. City & North Liberties, O Hogan(e) 19; Small County, O Hogan(e) 18; Costlea, O Hogan 11; Clanwilliam, Hogane 11; Connologh, O Hogane 21; Kenry, O Hagane & O Hogan 9. City & Liberties, O Hogane 7; Kilmore & Orrery, O Hoagne 10. One may find examples of the northern name O Hagan, for example in Loughinsholin Barony, Co Derry, with 17 families, but this research lies outside the remit of this article, which is strictly covering the form Hogan. In the mid 19th century, and the appearance of Griffith's 'Primary Valuation' of Irish property, the top counties for Hogan are Tipperary 800, Limerick 228 + 38 city, Clare 219, Cork 145, Kilkenny 142 and Waterford 109. Thus, Hogan is primarily a Munster surname. By 1890, and the 'Special Report on Surnames...in Ireland' by R.E. Matheson (1894, 1909), which is based on the birth registrations for that year, most Hogan registrations were in counties Tipperary, Dublin, Limerick, Clare and Cork. Michael 'Galloping' Hogan, the Rapparee, whose daring exploit during the Williamite War (1690) has gone down in legend. Hogan, and his band, controlled much of the territory around the Tipperary/Limerick region. He led the attack on William's Siege Artillery train, camped at Ballyneety, on the night of 11th August 1690. William was already at the gates of Limerick city, and just needed his huge artillery train (153 wagons drawn by 400 horses) to complete the capture of the city. He wasn't to get it. Hogan, with Patrick Sarsfield, the valiant commander-in-chief of the Jacobite forces, at his side, found a way through the Orange lines, at the dead of night. The raiding party consisted of 500 men, who took the Dutch and Danish elite troops by surprise. William's artillery was blown up in a spectacular firework display, which William would no doubt have seen and heard. Another Munster Hogan, also Michael, was a Limerick man, a fine poet, known locally as 'The Bard of Thomond'. He was born in 1828 in Thomondgate in Limerick city. His great collection of narrative verse on the sufferings and struggles of his country throughout history, was entitled 'The Lays and Legends of Thomond'. One of the best poems therein is the story of a Limerick hellraiser who meets a notorious lady ghost, on Thomond Bridge, as he wends his drunken way home one stormy Christmas Day at about 2 am: 'Drunken Thady and the Bishop's Lady'. MIchael Hogan, who is still undervalued as a poet, particularly by the 'Oxford' glitterati, died in poverty in 1899. A statue of him was erected, next to King John's Castle, and just before Thomond Bridge, in 2005. With comrade boys sat gaily drinking! Leave a message for HOGAN family members. Seeking sibling and parent information for Luke Hogan Sr., Oct, 1799, Borrisokane, Tipperary, Stone Mason by trade. Emigrated to Canada with Wife, Elizabeth (Bollard or Ballard) in 1832. Invite more HOGAN family members! Click 'Invite' to connect with more members of the HOGAN tribe.